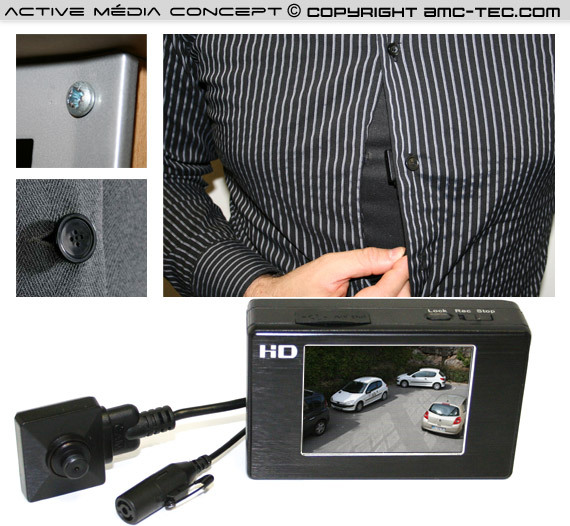 This micro camera is equipped with a sensor SONY HD CMOS 800 TV lines. The resolution is 1280 X 960 pixels for our camera BU-960-HD is that it provides a very powerful image capture for optimum results from your videos. 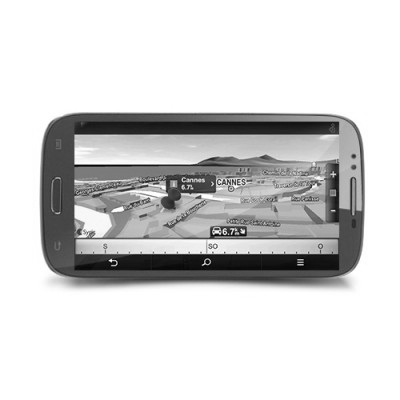 It operates with a minimum of 0.05 lux brightness and has a pinhole lens (pinhole-type) 78 ° angle of view. Simple installation thanks to its connectivity via mini HDMI connection that you transmit high quality audio / video high definition. Featuring the "Wide Dynamic Range" is intended to manage the backlight, which will give you clear images even in circumstances where the lighting can vary excessively. The main advantage of this tiny camera has its flat design and its purpose threaded type pinhole (pinhole), allowing you to tailor tips "screws or buttons" depending on usage. It is coupled to a sensitive lapel microphone that you can easily fix with its pin. This mini hidden camera is perfect to be hidden behind a shirt in configuration "button" or for example, behind a complaint, a cabinet, a rack configuration "screws". 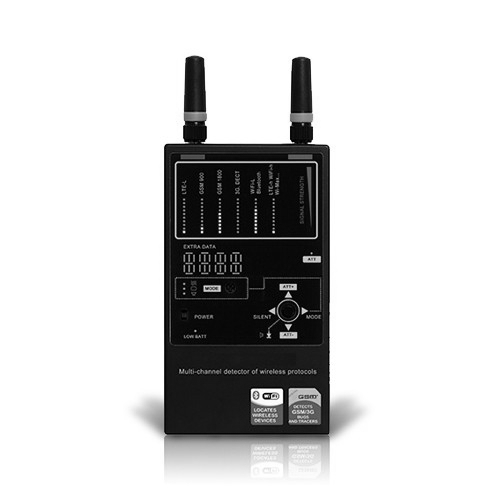 No external power since our mini camera platform is directly driven by the recorder with its mini HDMI connector. 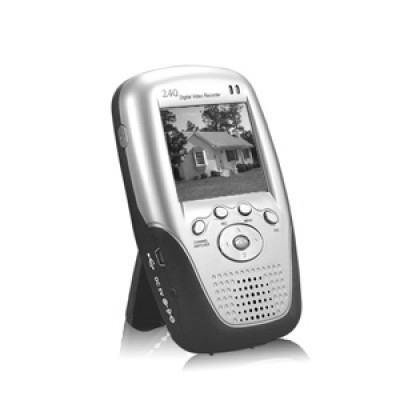 The strengths of our micro digital recorder portable professional audio-video is its miniature size, quality, HD video recording is adjustable up and bit 1280 x 960 pixels at 25 fps. 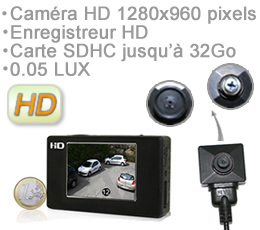 Mini HD recorder is equipped with a 2.36 inch touch screen integrated, efficient and easy to use thanks to its intuitive menus in French, compatible with our HD camera with a microphone HDMI or so with a standard analog camera. It supports vibration and shock without problem while recording since there are no moving parts, its memory card (4GB supplied) is expandable to 32 GB. 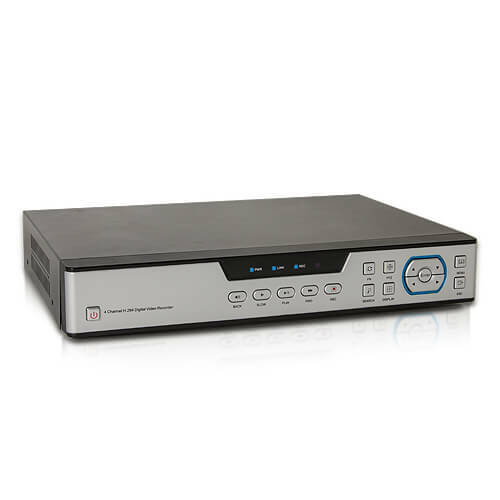 Our DVR-500-HD has multiple recording modes, motion detection, continuous mode programming and all of our videos are time, there is an indelible image counter images (time code). The detection of movement of our recorder can be over 16 predefined areas by you to remove such a zone or a street that leaves the wind could you start a recording inappropriate. Wired system between the recorder and camera, it delivers directly to the power supply different types of cameras hidden camera button, camera paw and micro-cameras, etc. 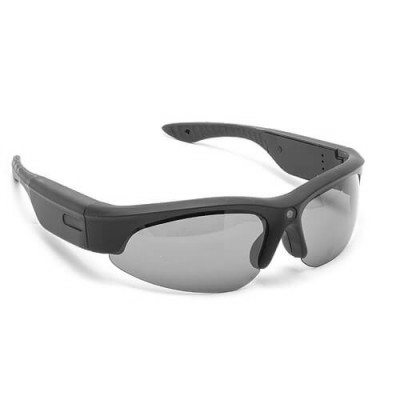 .. it is the HD DVR that powers the camera so a single wire for an audio / video and power which avoids extra batteries and a multitude of external cables, adjusting its level of taking your HD recorder is directly on the touch screen. 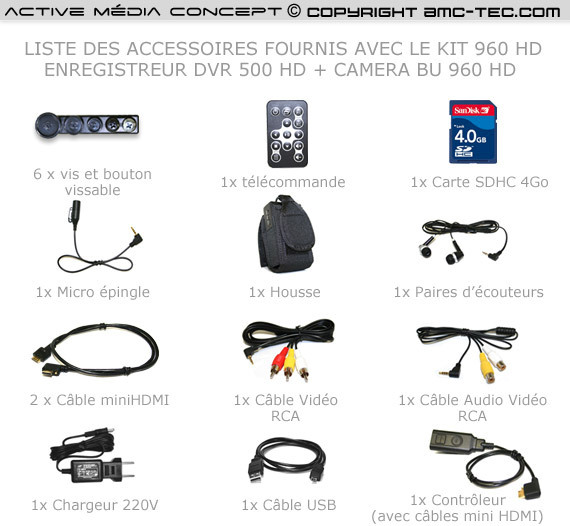 The recording format of our HD DVR is 960 pixels, the interface is in French so easy to navigate. 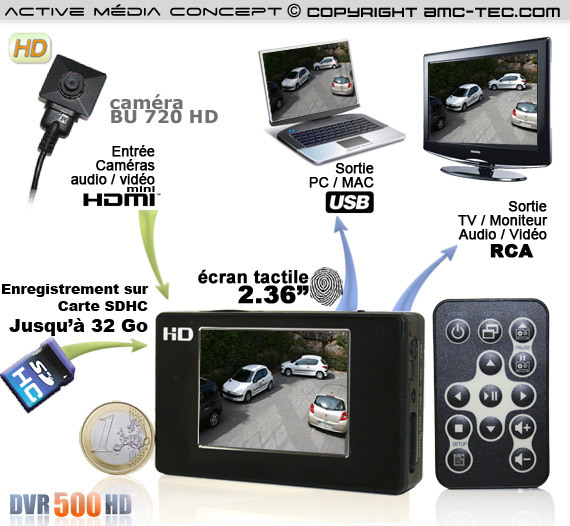 The size of the HD recorder is compact and its ports are HDMI and USB, DVR-500-HD is compatible Mas OS and Windows. The screen of the DVR-HD High Contrast allows you to have clear images during recording or playback. All video files are in ASF format and easily accessible with your computer for playback or videos recovery by simple drag and drop via USB, the format of video files in ASF is playable on most media player. Using our HD recorder may also be associated with one of our cameras sold on our sample site (Ref: BU550 CCD camera wired 550 lines 0.2 Lux button and screw color and audio) or (TAC550 Micro CCD camera embedded paw 550 lines color with audio) or (BAG450 leather bag CCD camera 450 lines video and audio) or (CAP-450 Cap Camera Color CCD 450 Lines) or the (NLS-42 Micro Inspection Camera Ultra Miniature Color 480 lines) you can find among others in the category camera & hidden camera only has to know that you need a aliùmentation apart for all analog cameras. The autonomy of our DVR-500-HD continuous recording mode is plus or minus 3 h 15, you also put the recorder settings HD loop on its memory card.You can increase its autonomy until 12.30 by adding an additional battery (optional ref.BA-69). Different type of business can use our kit as HD recorder, video surveillance assets like (home, cottage, hut, etc. ..) monitoring site (protection machine tools, shed, warehouse, etc. 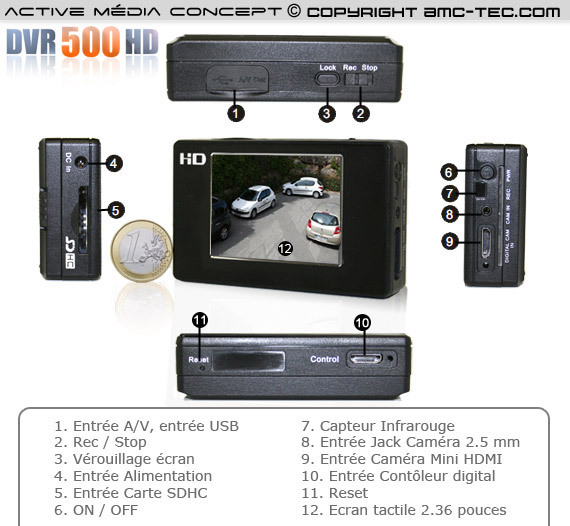 ..) but also Investigation, hidden camera Research Officer, Police, to our general DVR-500-HD is a professional tool. Its size, its performance and robustness combined with our cameras option below make it an instrument of choice for discrete and mobile applications. The operating system is in French or English, removable internal battery (Li-lion 3.7 V / 2200 mA), a 4 GB SDHC card is also provided which gives you about 1 hour of recording in full HD quality. A wired remote mini HDMI connector is included with your HD DVR, the remote to function as on / off and record / stop buttons and a button to take snapshots of images from the recorder's input. It takes a few seconds to start and start recording. 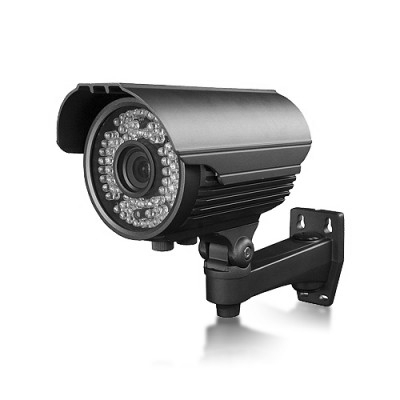 An infrared remote control is also provided with our HD recorder, it allows you to control the HD DVR remotely. HD remote.